I was very productive over the past few months. It was just December last year that I released my ?? ?Megatro Vol1??? intros pack with 28 Oldskool Demomaker productions of mine. I learned new stuff with the tool and enhanced some of my older intros and also branched out into new territory, the creation of multi-part mini demos with OSDM rather than just simple single part intros/cracktros. 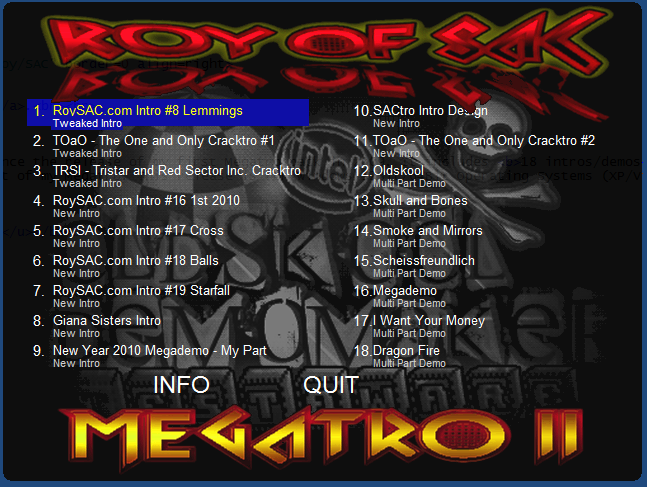 You can find a whopping 7 of such multi-part demos in my new Megatro II release. Then there are also a bunch of new intros/crack intros that I created and even a nostalgic release for the Commodore 64 classic ?? ?Giana Sisters???. The interface was like the one for the first release programmed by myself in Pure Basic. I made a lot of changes to it and enhancements that you will hopefully notice and appreciate. Another difference to my first Megatro release is also the fact that this pack is running in ?? ?windowed mode??? instead of ?? ?full screen???. The main reason for that is that some of my new productions utilize the ?? ?Skin Window??? feature of OSDM, which creates a custom frame for the intro or demo to run within. I did not want to switch between full screen and windowed mode all the time in an unpredictable manner and instead decided to run all productions in windowed mode this time. The NFO viewer within the interface was also improved. What I did not do this time, was to create a special intro just for this release. I thought that my enhancements to the interface will compensate for this shortcoming. Here is the list of all 18 productions that I included in this release. It is total 10.6 MB in size and can be downloaded via a link from this page. Here is a screen shot of the new interface. Note: I also did not make the same mistake as last time, where I released at first the pack only with an executable for 64Bit operating systems. Users that are still running on 32 Bit Windows OS could not run it until I released another 32 bit version of the pack. This pack was compiled for 32 Bit from the start and also runs on 64 Bit versions of Windows XP, Vista and Windows 7. The latest production of mine, which I just finished did not make it into the pack. It?? ?s the biggest production of mine so far, using features that I never used before until now, such as multiple Vector Objects and 3D Balls. It is call NEW WORLD ORDER and runs for about 4 minutes. The video capture is not the best quality. It?? ?s not very smooth, which is a consequence of my issues with video capturing since I upgraded to Windows 7 64 bit a few weeks ago. Some of my tools work only partially and some not at all, so I apologize for the sub-par video quality in advance already. I suggest downloading the ca. 1 MB Windows executable and run the production on your own PC. Backup URL to Video on vimeo (http://www.vimeo.com/9248008). More details and download links are available at the main page for my New World Order Demo production. I hope you will like it. It was a lot of work, but also a lot of fun to make.